Always used to enjoy watching this when I was a kid so in the absence of it being brought back on TV lets have a predictions thread. I will start with - 'In the future will we be able to record our dreams'? I've always been fascinated by what's going on behind the scenes with technology. I get the impression that whatever is released to the public is just a spit in the ocean compared to what's being developed. One of the most amaizing things I saw was regarding drone warfare. It was a clip on facebook where a single drone, just a few inches across, was capable of being programmed to deliver a single explosive to a person's head. That person would be pre-recognised by the drone. These drones can be delivered to the designated area by literally dropping them out of a cargo plane by the million. Swarms of programmed locusts sprung to mind. Not sure if it was true but it's certainly feesable. If that's what they can show us, imagine what they're doing behind the scenes that they want to keep quiet. The BBC had to axe it because it was taking away valuable screen time from things like the One Show and stuff about antiques. The linos are probably within possibility now, since they would only have to more in straight lines. Think a Roboref that could follow rapid changes of play as well as turn and move and adjudge fouls is still sci-fi. 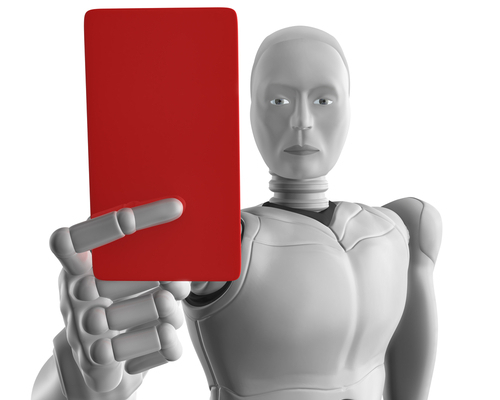 Robofans could be programmed to sling abusive remarks when they detect a RoboLino in proximity though. An AI ref wouldn’t be in the form of a droid. It’d be a computer utilising multiple cameras in real time to identify fouls etc. Decisions would be signalled via the stadium screens and PA system. Francoisvander or else wrote: Always used to enjoy watching this when I was a kid so in the absence of it being brought back on TV lets have a predictions thread. Maybe but the interface for it will probably be the most important & difficult thing to invent. On a related note, one day brain scans will be so advanced on a molecular level that a completely new understanding of mental illnesses may emerge, rendering the psychiatric medications of today as almost of the stone age, in comparison to the new treatments yet to be discovered. Currently, untreatable brain degenerative diseases such as dementia or MND will be 100% treatable, as will ALL types of cancer. Personal aeronautical devices will also be commonplace. Driverless cars were a thing of the future not so long ago but are now being tested in the UK. Not sure I am fully on-side with them yet. I think there'll be a learning curve, a lot of accidents and eventually a lot of people will be put out of work. The age of automation is upon us ... and our government are doing nothing to prepare for it. If Samba is correct that we will be able to prolong the life's of MND, Dementia and Cancer sufferers, then Tomorrows World needs to find ways to deal with increased populations, while protecting the environment. Relocation to the moon/Mars anyone? There will simply have to be a universal China style limit on the number of offspring a person can have. The sooner the better in my opinion. I've said it before. As soon as affordable, high quality virtual reality becomes generally available then large swathes of mankind will barely leave their homes again. Add in the sexual potential of that technology and many will never bother with a real relationships. There will be people who barely leave the four walls of their homes for most of their adult lives. The DFS Sale will end. only1post wrote: If Samba is correct that we will be able to prolong the life's of MND, Dementia and Cancer sufferers, then Tomorrows World needs to find ways to deal with increased populations, while protecting the environment. Lights out at 70. I'm not wrong. So you would be ok with Billy and Sir Trev being put down. I do some work occasionally at Diamond Light Source. It's a particle accelerator similar to a mini CERN, used to conduct experiments to desconstruct the nature of materials (amongst other things). When I was there a couple of years back, I noticed a load of bags of carrots stacked up in one of the labs. The bloke there (scientist, Austrian, not known for humour) explained that they were investigating the subatomic makeup of a carrot which, apparently, is a very simple structure. Within ten years, he said, they would be able to recreate a carrot by clipping together like lego bricks the requisite atoms of oxygen/carbon/whatever that are knocking around in the atmosphere. A carrot, conjured up out of thin air. An end to starvation, there. The tiny machines required to manipulate the atoms would be made by other, similar, tiny machines so theoretically they should be free. Everyone can have one. There's more. Oil? Could be made from atoms in the same way. An end to the oil economy. Gold: the same. Eventually (and he suggested fifty years as the likely timescale) they could scan me or you to the most infinitesimally small detail, and then recreate us atom by atom. If you have cancer, they recreate you without cancer, and terminate the old you. Other diseases, disabilities, abnormalities: the same. If you're just old and dying, recreate a new you better than the old one. If you need to go to Australia, they scan you, recreate you instantaneously in Australia, and terminate the old you. If you need to go to Mars: the same. only1post wrote: So you would be ok with Billy and Sir Trev being put down. I'd flick the switch myself. No room for sentiment here, get in the queue. Greatest Cockney Rip Off wrote: The age of automation is upon us ... and our government are doing nothing to prepare for it. I went to a seminar on manufacturing technology this week. One slide in another bod's presentation caught my eye: the number of industrial robots per manufacturing workforce capita. 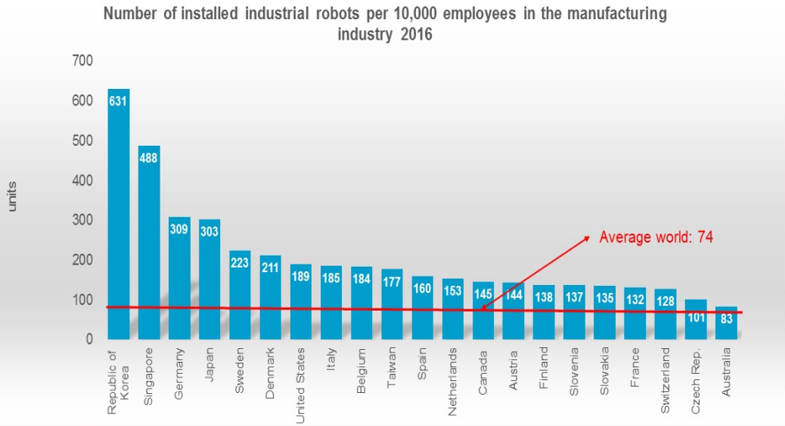 Average is 7.4 robots per 10k employees, we have 7.1 which doesn't even get us in the top 20.